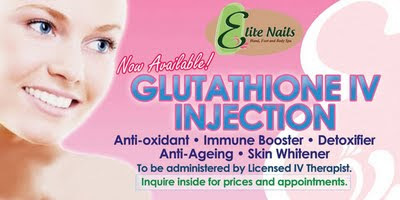 Elite Nails Hand, Foot and Body Spa: Glutathione IV Injection now available at Elite Nails Spa! Glutathione IV Injection now available at Elite Nails Spa! Elite Nails Spa brings to you the latest rave in skin whitening - the Glutathione IV Injection that will let you achieve fair and younger looking skin in just a short span of time. Glutathione IV injection is said to be the most effective skin whitening procedure as it targets the cells in our body. The cells are revitalizes and helps in activating the anti-oxidants in the body that aids the liver cells in particular to regenerate from damages and keep it healthy. There is a side-effect in taking/using glutathione and it’s known to making the skin whiter and fairer. Call us to book your appointment today. Ever tried a Ventosa Treatment? Body Scrub: Why do you need one?